The Oogie Boogie Party – Disneyland Halloween 2019 Tips for Visiting & What to Expect! Find 10 Things to Know About Halloween at Disneyland 2018, and information about Mickey’s Not So Scary Halloween Party 2019 and more! Halloween Time at Disneyland is one of the most popular times of year to visit and it changes a little bit each year. 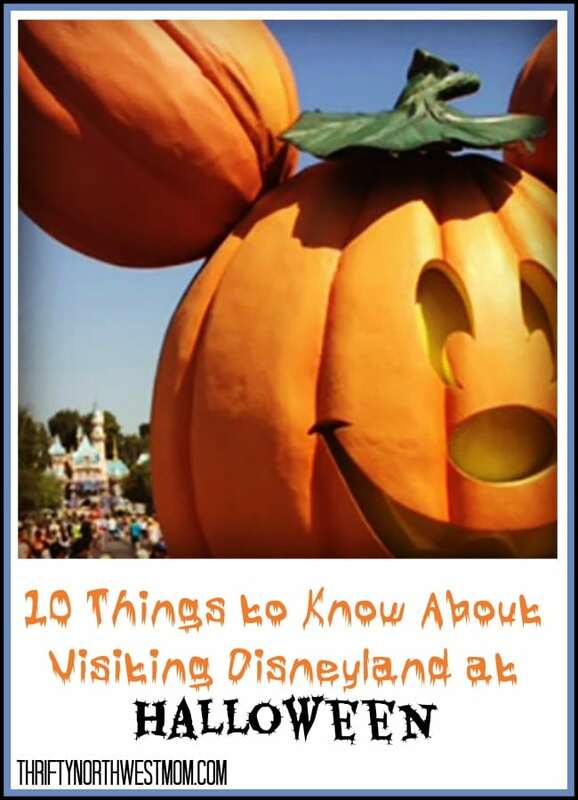 If you’re thinking about a trip to Disneyland this fall, and looking for Disneyland Halloween tips, here are 10 things to know about Halloween at Disneyland 2019. This year things are changing up a bit. Disneyland released their Halloween dates for 2019! In addition to Halloween Time information, they released tons of information on the new Oogie Boogie Bash at Disney California Adventure Park which will replace the previous Mickey’s Halloween Party. The biggest difference with this years party is that the Oogie Boogie Bash will be held in the California Adventure park, rather then over at Disneyland. You can still expect to find many of the same fun Halloween decorations that you are used to at Disneyland, but the separate party will be moved this year. 1 – Halloween Time at the Disneyland Resort will begin September 6 and run through October 31, 2019. Treats, décor, ride overlays and more will be showcased at both Parks. 2 – Oogie Boogie Bash – A Disney Halloween Party will take place in Disney California Adventure Park and replace Mickey’s Halloween Party this year (2019). This is modeled after Tim Burton’s The Nightmare Before Christmas. 3 – Dates for the event begin on September 17, 2019 and tickets will only be available through Disney directly beginning April 23rd for passholders, DVC members and Disney Visa Card holders and April 30th for the general public. Crowds are normally a little lighter in September. October is also a great time to go, because so many kids have their fall break and won’t have to miss school for a vacation. 4 – The Oogie Boogie Bash will include the fan-favorite Frightfully Fun Parade and trick-or-treat trails as well as some new immersive entertainment and character encounters. 5 – Halloween Time includes photo ops that you won’t get any other time of year. Even the characters dress up in their costumes. You can also find seasonal menu items for purchase, like butterscotch flavored beignets and Mickey pumpkin caramel apples. The entire resort completely transforms and you can feel it in the air. 6 – Halloween Time is included with regular theme park admission, but the Oogie Boogie Party is not. It is important to note that the Oogie Boogie party will start in the California Adventure park at 6pm on most evenings, and at that time the park will be closed to everyone that does not have an Oogie Boogie Party ticket (but Disneyland park will be open to guests who do not have the Oogie Boogie Party tickets during this time). 7 – The Oogie Boogie Halloween Party tickets can get you into the park three hours before the party starts. The party lasts five hours, so you can get up to eight hours of Halloween fun at Disneyland. Ticket prices start at $110 and go up to $145 per person. There are not any discounts for kid tickets, but you do not have to buy tickets for kids that are 3 or younger. Dates sell out quickly once they go on sale! 8- One of the first things that you’ll notice during Halloween Time is the Pumpkin Festival on Main Street U.S.A., spotlighted with the giant Mickey jack-o-lantern. What you may not know is that there are hundreds of hand carved pumpkins and no two are alike. 9 – Costumes are allowed, However there are many guidelines to what can and cannot be worn in. You can find the Disney costume guidelines here. Find more details on this years Halloween party at Disneyland here too. 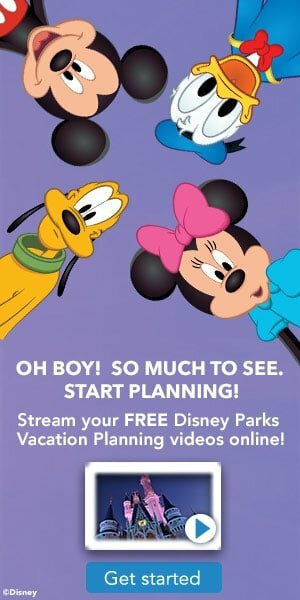 You can save on their Disneyland vacations with Get Away Today’s 5th Day Free tickets and hotel discounts! Additions they introduced last year, and will still be available in 2019! Guardians of the Galaxy – Monsters After Dark: Discover a brand-new story, song, media and special effects in – Only happening during the Halloween time. Cars Land turns into a spooktacular adventure! 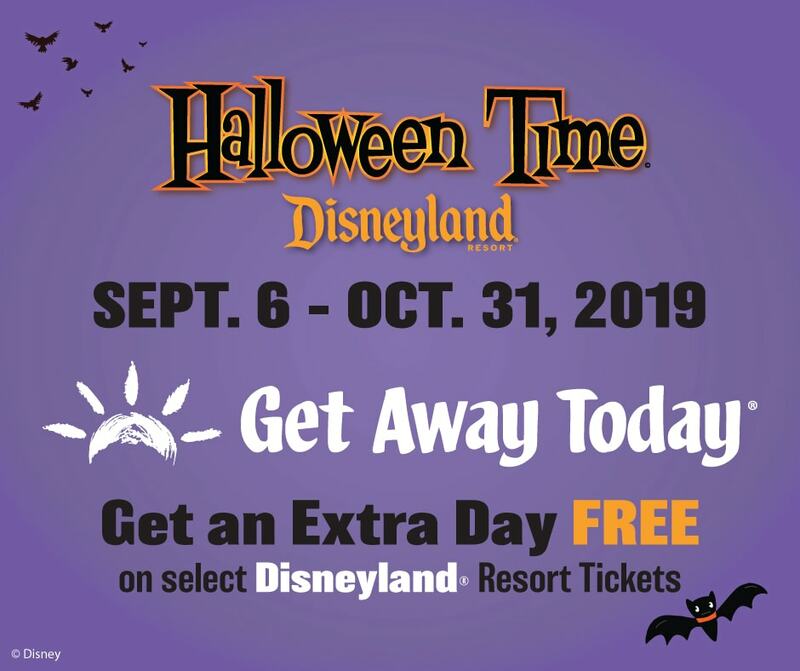 If you’re thinking of booking a Disneyland Halloween Time vacation, you’ll want to book soon because once the dates are announced, people start booking their packages and the best deals sell out first. We recommend going through our favorite Disney travel agency, Get Away Today. They offer tons of exclusive Disneyland ticket discounts and hotel specials, and have a Best Price, Best Service Guarantee. Check out their packages at getawaytoday.com and use promo code: THRIFTYNW for an extra $10 off their already discounted prices. Best Times To Visit Disneyland! Plus, Put Your Disneyland Vacation On Layaway (Spread Payments Out)! Sending this to my hubby! Our daughter is obsessed with Halloween and would have the most fun time going!